This is to acknowledge the receipt of your message Dated 7th 2008. 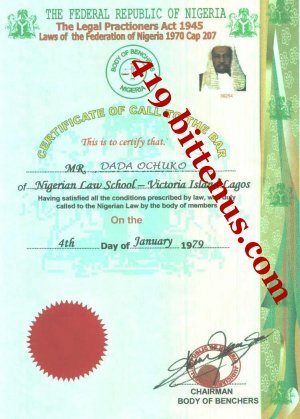 Dada Ochuko & Co. SolicitorAdvocates and Notary Public is a law firm, we handle civil matters, criminal cases, properties, Estate management and matrimonial matters. We are in receipt of your message with reference to your Inheritance Claim with Eco International Bank plc. Our official etiquette demand that you pay a refundable consultationfee of $520 dollarsto enable us proceed to contact the above Named Bank for further inquiries and know the position your inheritance account with the Bank. We shall update you with more results on our inquiries and the Procedures to be implemented immediately after receiving the Consultation fee and upon our successful investigation, we shall bring to you our position with your claim, if we will handle all legal mattersin that respect. Call us for details. Attached is my call to bar certificate for your perusal.